If you wish to support Lhamo Tso's visit and help her continue to campaign for the release of her husband, please make a tax-deductible donation here. Click on Donate General Contribution and under Special Instructions write "Lhamo Tso Fund". (San Francisco) At a time when self-immolations are happening with increasing frequency in Tibet, another form of personal protest action is taking place in the US. A Tibetan woman Lhamo Tso arrives in San Francisco next week to begin a 3 week tour of California organized by the Bay Area-based Committee of 100 for Tibet. 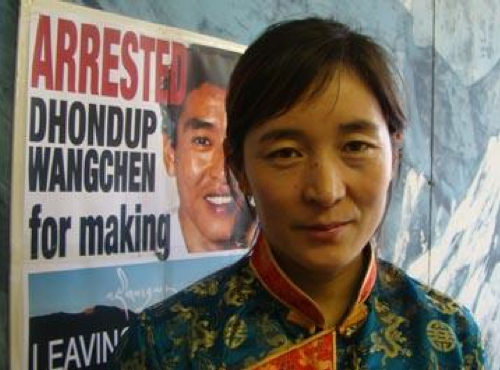 She is here to build awareness of the case of her husband, filmmaker Dhondup Wangchen, currently serving 6 years in Xichuan Labour Camp in China, and to campaign for his release. On 28 December 2009, Dhondup Wangchen was sentenced to six year's imprisonment for "subversion", following a secret trial in Xining. His family believes he has been tortured while imprisoned, and that he has contracted Hepatitis B and his health is failing. His wife, Lhamo Tso, is living under hard conditions since she escaped to India and has had to support not only her four children, but also the parents of her husband. This is her first visit to the US. Watch the complete 25-minute documentary "Leaving Fear Behind" on YouTube here. Read more about the making of the film here and sign a petition to Chinese President Hu Jintao calling for the release of Dhondup Wangchen here. The Committee of 100 for Tibet – an organization dedicated to advancing the Tibetan people's right to self-determination – believes the case of Dhondup Wangchen highlights the urgent need for basic human rights and democratic freedoms in Tibet. The Committee of 100 for Tibet chairman, Tenzin N Tethong, has called on the Chinese government to release Dhondup Wangchen immediately, if only on humanitarian grounds. A series of public speaking events is being held in the Bay Area for Lhamo Tso at which her husband's film “Leaving Fear Behind” will be shown. Other events are being organized in San Diego and Los Angeles. For more information visit the Committee of 100 for Tibet's website at www.c100tibet.org. BEIJING—A wave of violent unrest in urban areas of China over the past three weeks is testing the Communist Party's efforts to maintain control over an increasingly complex and fractious society, forcing it to repeatedly deploy its massive security forces to contain public anger over economic and political grievances. The simultaneous challenge to social order in several cities from the industrial north to the export-oriented south represents a new threat for China's leaders in the politically sensitive run-up to a once-a-decade leadership change next year, even though for now the violence doesn't appear to be coordinated. There is no evidence to suggest the recent violence is part of a coordinated movement—the party's greatest fear—nor do the events threaten its grip on power given the strength of China's security apparatus, and its booming economy, analysts say. They are nonetheless troubling for China's government which, unnerved by unrest in the Arab world, has detained dozens of dissidents since appeals for a "Jasmine Revolution" in China began circulating online in February. The Mideast uprisings so far haven't inspired similar mass protests in China. The recent violence, however, has exposed the limits of the government's ability to control the urban population using a sophisticated array of tools from Internet censorship to surveillance—part of what party leaders refer to as "social management." Authorities have turned to displays of raw power, deploying paramilitary police and armored vehicles in at least three cities in as many weeks, to prevent the violence from spiraling further as protesters have repeatedly directed their anger at government buildings, often ostentatious symbols of power. What connects the violence is the way that a flashpoint—in the case of Inner Mongolia, the death of a Mongol at the hands of a Han Chinese truck driver, and in southern China, the assault by security personnel on a pregnant migrant worker—sets off much wider conflagrations. The disturbances could reflect badly on President Hu Jintao, who has tried to promote the concept of a "harmonious society" and who is due to retire as party chief next year. "There's an increasing sense of frustration that [leaders] are unable to put out a consistent, unifying message, even within the Party," said Kerry Brown, head of the Asia program at Chatham House, who met senior party officials last week. "Local officials are overreacting partly because of a lack of clear leadership at the top." But the unrest is likely to strengthen the clout of Zhou Yongkang, who technically ranks ninth of nine on the Politburo Standing Committee but wields huge power as he oversees the police, intelligence agencies, prosecutors and courts. Social unrest has been rising steadily in recent years: In 2007, China had more than 80,000 "mass incidents," up from above 60,000 in 2006, according to the Chinese Academy of Social Sciences, although many involved no more than a few dozen people protesting against local officials. No authoritative estimates have been released since then, though analysts citing leaked official figures put such incidents at 127,000 in 2008. Since February, Messrs. Hu and Zhou have called for tighter restrictions on the Internet, which provides a conduit for people to share anger at government policies and malfeasance and learn about unrest. Authorities have been careful to balance their use of force with conciliatory gestures, including the removal of some local officials. State media have also been reporting the unrest relatively quickly and openly, compared with previous years, in what some analysts see as an attempt by the government to take control of the narrative ahead of bloggers and other unofficial media. A Monday editorial in the Global Times, a tabloid linked to the Communist Party, warned against trying to connect the recent incidents of unrest and draw conclusions about China's social stability. "China is not a nation where public anger collectively seeks to topple the existing order. It is time to debunk this ludicrous lie," it said. The violence in Zengcheng, a town of about 800,000 near Guangzhou, began Friday night when security personnel pushed to the ground Wang Lianmei, a 20-year-old pregnant street vendor from the western province of Sichuan, as they tried to clear her stall from the road, according to state media. A crowd of migrant workers began attacking security guards and police with stones and bricks, as rumors spread that Ms. Wang had been injured and her husband, 28-year-old Tang Xuecai, killed, the state media reports said. Local authorities tried to quell the unrest over the weekend by setting up a special task force to investigate the case, arresting 25 people and organizing a news conference at which Mr. Tang said that both his wife and their unborn child were unhurt, the reports said. Xu Zhibiao, Zengcheng's Party chief, went to visit Ms. Wang in the hospital and took her a basket of fruit, the China Daily said. But the violence flared again on Sunday night, witnesses said. "We were all told not to go out on the street," said Dong Xingguo, a migrant from Sichuan who is working as an IT engineer in Zengcheng. A Zengcheng government spokesman said: "Currently the situation in Zengcheng is stable. No death toll." He confirmed that there were still riot police on the streets to keep the peace. Andrew Browne and Jason Dean in Beijing and Yang Jie in Shanghai contributed to this article. Madam Chairman, Congressman Berman, Members of the Committee: As Chairman of the Board of the International Campaign for Tibet, I appreciate the opportunity to testify on an issue that challenges our moral compass and our ability to settle fundamental differences between peoples without resorting to violence. There are few international issues that have remained unresolved as long as Tibet has, nor one that has so intensely engaged the emotions of the American people. We care about Tibet. As Senator Daniel Patrick Moynihan once said, "The Chinese invasion of Tibet in 1949 does not become less criminal because it has remained in place over a long period of time...the Chinese have been brutal and have made no bones about it and have made no apologies for it." The question of Tibet’s incorporation into the People’s Republic of China and the status of the Tibetans impacted by Chinese rule is an issue that continues to create obstacles in the U.S.-China relationship, and for good reason. China resolutely refuses to recognize the Tibetans’ basic rights as defined not only by the Universal Declaration of Human Rights but also by the Chinese Constitution that contains clear protections for national minorities whether they are Uyghurs, Mongolians or Tibetans. I would like to note that more recently, we have begun to witness the same intensified persecutions against Chinese citizens also. Artists, writers, poets, activists, lawyers and free thinkers -- even simple farmers have been aggressively pursued, in some cases “disappeared,” imprisoned and even tortured – all outside of the framework of law. The vast apparatus of the People’s Republic of China moves against any expression of free-thinking that is perceived as challenging the authority of the Communist Party -- no matter how nonviolent and benign -- which sounds suspiciously like North Korea, Burma and any other authoritarian regime on the planet. We should view the subjects of today’s hearing – North Korea, Burma and Tibet – as case studies that are not dissimilar to failed systems where long-simmering tensions have erupted into violence elsewhere in the world. Cases where legitimate grievances are left unattended and fundamental freedoms are violently suppressed where the voice of the people is stifled and the rule of law fails to protect, chronically and systematically. To quote Secretary Clinton, Beijing is on a "fool's errand” to think it is immune to change or that it can continue to suppress the will of its people to communicate freely as human beings on this small, interconnected planet. If the concept of the will of the people is meaningful to us at all -- as many believe it should be -- then we need to look very carefully at how we engage the People’s Republic of China vis-a-vis Tibet. Here we can do and must do better. We cannot engage the Chinese Government while forgetting our foundational principles of democracy and human rights. We cannot disconnect from people’s quest for happiness -- therein lies the stability and international security for the whole planet. The more we create policies driven by a sustainable, long-term commitment to universal values, the less vulnerable our societies will be to sudden -- and often violent -- shifts in global dynamics. Recent events throughout the world remind us that policies designed to maintain the status quo -- when the status quo is against the will of the people -- have failed. This is morally wrong and puts us on the wrong side of history. President Obama has rightly championed the universality of human rights, and the Administration seems to have found a voice in discussing universal rights: “We support a set of universal rights. Those rights include free speech; the freedom of peaceful assembly; freedom of religion; equality for men and women under the rule of law; and the right to choose your own leaders.” These rights are also the rights of Tibetans and Chinese, and as the US-China relationship evolves, we must define policies with China that uphold the moral framework of who we are as a people and advance the strengths of our bilateral relationship. Congress understands this imperative. For years, you wrestled with the annual debate over Most Favored Nations trade status for China, weighing China’s human rights record against the potential for U.S. business investment in China. I believe you eventually came down on the wrong side of this argument, granting China permanent MFN status, but in the debate, Congress wisely identified policies and resources to try to move China towards a more progressive political system, a system that would provide protections for the human and civil rights of its people and encourage the development of a vital civil society. In fact, if not for Congressional initiatives, I believe Tibet might not have survived, given the urgency and complexity of the U.S.-China relationship. Now, I am no stranger to Capitol Hill. I know many of you well but many of you are new to this Committee and were not here for His Holiness the Dalai Lama’s first congressional audience in 1987 or the Tibetan Policy Act in 2002, or the Congressional Gold Medal presentation in 2007 or the Committee’s last hearing on Tibet in 2007. I can tell you that you inherit an important legacy. Republican and Democratic Chairmen of this Committee and its Senate counterpart, Jesse Helms, Claiborne Pell, Ben Gilman and Tom Lantos led their colleagues in a strong bipartisan response to the outrages in Tibet. I ask you to carry this legacy on. But much has changed since the Committee’s last hearing on Tibet. First, the Chinese government has intensified its already restrictive policies that undermine Tibetan culture and religion, increasingly so since the 2008 uprisings in Tibet. Tibet remains largely sealed off to the outside world. Tibetans’ language has been downgraded, their economic resources appropriated by the state and the people have very little freedom of expression. Hundreds of Tibetans, including monks and nuns, remain in prison for engaging in nonviolent dissent and are subjected to torture or ‘reeducation.’ The Chinese Communist Party has even gone so far as to say that the reincarnation of Tibetan lamas cannot be recognized without the permission of the Party. This is a distinct violation of a religious and cultural tradition that has been in place for a thousand years. This from a communist government that is by its own definition atheistic. Second, His Holiness the Dalai Lama has fully devolved his responsibilities in the Tibetan exile government to a democratically elected Prime Minister who will serve as the Tibetan people’s head of government. This is the culmination of the Dalai Lama’s decades-long effort to build a genuine democracy for his people. Today, this exile government does function democratically with three distinct branches, the Central Tibetan Administration, the Parliament in Exile and the Supreme Justice Commission. The new popularly-elected prime minister, or Kalon Tripa, is Dr. Lobsang Sangay. This remarkable new leader was born a refugee in India. His parents, originally nomads, sold a cow to pay for his education. He seized the opportunity -- provided by the Untied States Congress -- to study in America under the Tibet Fulbright Program, which has brought more than 300 Tibetans to American universities since 1993. Lobsang Sangay earned his law degree from HarvardUniversity and was serving as a Research Fellow at Harvard’s East Asian Legal Studeis Program at the time of his election. He now returns to India to guide the Tibetan people through this unprecedented transition. I urge the Committee to hear directly from Tibetan leaders who represent the views and priorities of their own people. His Holiness the Dalai Lama will be in Washington for 10 days in July. Lobsang Sangay will be here as well. Mr. Lodi Gyari, the Special Envoy of His Holiness the Dalai Lama, is a Washington resident. Third, as China expands economically, it has assumed a far more self-confident posture. I imagine that the Committee and the Administration may be familiar with this dynamic in many areas such as currency, intellectual property, and the South China Sea. Anyone, anywhere who voices concern for China’s policies in Tibet are met with shrill and dismissive attacks. China now includes Tibet as a “core issue” of sovereignty and territorial integrity- along with Hong Kong and Taiwan- effectively taking them off the table for discussion. Tibet has not been afforded the privileges of autonomy that Hong Kong enjoys under the ‘one party, two systems’ rubric although, ironically, the “17 point agreement” signed by the Chinese and Tibetan governments in 1951 was the first instance of this system. The agreement faltered and ultimately failed and was renounced by both sides following the 1959 escape of the Dalai Lama into exile. The fact is that the cycle of uprising and repression will continue in Tibet unless China deals with the legitimate underlying grievances of the Tibetan people. This is as clear today as it was in 1959. His Holiness the Dalai Lama, who seeks a negotiated solution for Tibet based on the needs of both Tibetans and Chinese within the Constitution of the People’s Republic of China, is facing a Chinese system that in practice pits Chinese interests against Tibetan interests and seeks assimilation rather than protection of Tibetan identity. It’s a Chinese policy planned by technocrats in Beijing who are thousands of miles and thousands of years distanced from the Tibetan experience. Stability achieved through the will of the people, not through force or coercion is the answer for Tibet. The Dalai Lama is the strongest influence in the Tibetan psyche. Tibetans may live in the People’s Republic of China, but they are not Chinese -- not to themselves nor to the Han Chinese who treat them as third-class citizens. The inability to recognize or change this, which in context is a genuine civil rights issue, will never allow the Chinese to equitably resolve and prevent the unending cycle of repression, uprising, and more repression. The Tibetan Policy Act is a cornerstone of the U.S. approach toward Tibet. I thank the preceding witness from the Administration for his testimony on implementation of the Act. I regret that the U.S. Special Coordinator for Tibetan Issues, Under Secretary for Democracy and Global Affairs Maria Otero, was not able to be here today. She has not yet publicly testified on Tibet. Undersecretary Otero is an expert on development among disadvantaged populations, among other things, and has much to bring to her Tibet portfolio. I urge the Committee to seek her input as the Committee gives further review to the Tibetan Policy Act. Oversight of the Act is warranted. For example, Congress has directed the establishment of a U.S. consulate in Lhasa. Lhasa has been on the top of the State Department’s priority list for consulates in China. The Committee should require that the Department not consent to another Chinese consulate in the U.S. until the Chinese agree to open one in Lhasa. This is an on-going issue but a rather important one that should be moved to the top of the priority list and frankly is, something I addressed in my previous testimony in front of this Committee. A central tenet of the Tibetan Policy Act is to promote dialogue between Chinese officials and the Dalai Lama’s envoys. There have been nine rounds of this dialogue since 2002. The most recent was in January 2010, now leaving the longest gap between rounds since the dialogue began. The dialogue has not lead to a breakthrough, as each side basically remains at first principles. The Chinese see it only as regarding the personal future of the Dalai Lama while the Tibetans see it as addressing longstanding, legitimate grievances and the survival of six million Tibetans inside Tibet. Under the Act, the State Department is required to report on the status of the dialogue. The report is not public, and last year’s edition was late. I urge the Committee to ask that the report be made public, and recommend that the Committee hear from Lodi Gyari, the Special Envoy of His Holiness the Dalai Lama and the key Tibetan Representative in the dialogue, on ways in which the United States can move this dialogue forward. The stated purpose of the Tibetan Policy Act is to “support the aspirations of the Tibetan people to safeguard their distinct identity.” Language is a key factor in shaping identity, and Tibetan language is actively under threat in the People’s Republic of China. Last year, Chinese authorities announced plans to restrict the use in schools of “minority” languages like Tibetan in favor of instruction in Mandarin. Tibetan school and college students protested against these plans. The scale of the protests across Tibet at a time of already intense political repression reflects the desperation of Tibetans about the marginalization and erosion of their language, the bedrock of the Tibetan identity, religion and culture. The Committee should urge the Administration to make bilingual education a central component in the U.S.-China education dialogue. The “100,000 Strong” educational exchange initiative should be broadened beyond just Mandarin so that American students can study in Tibet, East Turkestan and Inner Mongolia and learn their languages, and that students from those regions, not just Chinese students, can study in the U.S. The Tibetan Policy Act calls for advocacy for political prisoners. The International Campaign for Tibet monitors the status of Tibetan political prisoners, as does the Congressional-Executive Commission on China. I encourage the Committee to avail itself of these resources, and to request regular briefings from the State Department on the status of its advocacy with their Chinese counterparts. No Tibetan political prisoner has been released into the care of the U.S. since the first term of the George W. Bush Administration. This is clearly a result of the hardening of the Chinese position, the inadequacy of the U.S.-China human rights dialogue, and the failure to demonstrate a consistent human rights policy into the breadth of U.S. engagement with China. Perhaps the most notable political prisoner is the 11th Panchen Lama, Gedhun Choekyi Nyima, possibly the second-most important religious leader in Tibet who was abducted at the age of 6 after being recognized by the Dalai Lama. The Panchen Lama and his family were then abducted by Chinese authorities. He has not been seen for 16 years. The Tibetan Policy Act requires that the U.S. Ambassador meet with him. I have been asked to provide an update on the Panchen Lama’s whereabouts but redirect the question to the panel and ask, when was the last time such a request was made by the US Ambassador and what does the U.S. intelligence community have to say in regards to his the Panchen Lama’s whereabouts? Let me cite two other cases. Tenzin Delek Rinpoche, a highly respected senior lama from Eastern Tibet, was initially given a suspended death sentence in early 2002 on highly dubious charges of involvement in a series of bomb attacks on Chinese government targets. There are very strong grounds for claiming his confessions were extorted through torture amid suspicions that the real reasons for his incarceration were his popularity among both the local Chinese and Tibetan communities -- the Chinese authorities regarded him as a challenge to their demand for absolute authority -- and he was an active campaigner against corruption in local government. Despite the obvious risks, tens of thousands of people from his local area signed petitions this year calling for his release or retrial, and there are serious concerns for his health. Karma Samdrup, a high-profile Tibetan businessman and philanthropist, who had previously been embraced by Chinese authorities. He was sentenced to 15 years in prison in June of last year on charges of "grave robbing" dating back over 10 years, for which he had already been investigated and cleared at the time. Karma Samdrup provided funding for an environmental NGO run by his two brothers in Eastern Tibet, and was imprisoned when his brothers challenged illegal poaching by police and government officials. His brothers were also consequently sentenced to prison or "re-education through labor" -- one brother was sentenced to 5 years in prison on charges relating to an oblique reference to the Dalai Lama posted onto his environmental NGO's website. The imprisonment of the three brothers cast a profound chill across a globally critical environmental movement on the Tibetan plateau. I would ask Congress to return to the days when every member who visits China raises a case of a political prisoner in a coordinated strategy with the end goal of their release. If the Chinese refuse to discuss the status of these cases, we need to attach some value to their decision. The Tibetan Policy Act also includes “Tibet Policy Principles” that govern U.S. support for development projects on the Tibetan plateau. The Tibet-Qinghai railway, completed in 2006, has facilitated an unprecedented wave of migration of Chinese laborers into Tibet, who have benefitted from the employment and income generation provided by the railroad -- far more than local Tibetans. This railway gives merely a glimpse of the potential impact of the half dozen railway lines planned by the central government to link the Tibetan plateau with mainland China. They will open Tibet up to new levels of migration, tourism, and international trade, which of course, is not necessarily a bad thing but counter to Chinese propaganda, the Tibetans will not be the ones who “prosper”. Because of short sighted policies born in Beijing without proper Tibetan input, Tibet appears ill-prepared and ill-equipped to deal with these plans. This deserves much greater attention from the U.S. government. For example, the Committee should study how Hong Kong limits in-migration from mainland China. This can and should be a model for Tibet. The Tibetan Policy Act requires that Tibetan language training be available to Foreign Service Officers. I understand that this is provided for. Many points about the Tibetan Policy Act are properly addressed to the Administration. But Congress can do its part. The Committee should take a fresh look at how the nearly decade-old Act can be strengthened. As a first step, I recommend you review, and re-approve, amendments that were adopted as part of the Foreign Relations Authorization Act, H.R. 2410, which passed this Committee and the full House in 2009. I note that the companion measure, introduced by then-Ranking Member Ileana Ros-Lehtinen, contained the same Tibet provisions as the bill drafted by then-Chairman Howard Berman. This is a testament to the underlying bipartisan support for the Tibet issue. These amendments would strengthen inter-agency coordination and encourage multilateral cooperation on the Tibet issue, authorize appropriated programs and achieve a U.S. consulate in Lhasa. American aid helps hundreds of Tibetan refugees survive the dangerous crossing over the high Himalayas. We provide aid to Tibetans inside Tibet through grants to American NGOs that promote sustainable development, environmental conservation and cultural preservation on the Tibetan plateau. This is sensitive and often difficult work, and those who dedicate themselves to its success must navigate carefully with partners on the ground to advance Tibetan priorities within a Chinese system suspicious of outside interest. The office of U.S. Special Coordinator for Tibetan Issues ensures that congressional intent in its various legislative and policy expressions -- including the Tibetan Policy Act -- is understood and respected. With proper oversight, this Committee can ensure that the office of the Tibet Coordinator remains funded, staffed and accountable to law and congressional directive. These are all examples of concrete measures that Congress takes to ensure the survival of the Tibetan people and their ancient, unique and sublime traditions while China continues to press with obvious advantage against them. The two-pronged approach authored in Congress – policy and programs – has advanced the American values of self-reliance, dialogue, democracy, freedom and most of all hope– in the heart of Asia. It has also served to institutionalize the Tibet issue within the long-term U.S. China policy construct. I’ve seen the critical impact of congressionally appropriated funds for Tibetans. They are meaningful. With a vision for a positive outcome in Tibet, we can do more. There are hundreds of thousands of Americans who partner with Congress every day in supporting this cause. Once again, we can do more, however, we need to be more strategic. With the world changing as quickly as it is, with the internal pressures that are mounting not only in the ethnic minority regions of China but within the core of Chinese society and in its largest cities, there is an extraordinary opportunity, now, to resolve the issue of Tibet. We at the International Campaign for Tibet have never given up on the belief that Tibet can be saved with nonviolent resolution. Madame Chairman, Members of the Committee, we cannot be daunted by the steep incline in the road ahead. You have created much to build on and there are tangible steps going forward we must believe are possible. I am grateful to you all and close with the hope that the Committee will find adequate time for discussions with His Holiness, His Representatives and Prime Minister-elect, Dr. Lobsang Sangay in July. This is what I would like to leave you with. China is intensely focused on Tibet -- for rational and irrational reasons -- believing it can move quickly to checkmate. At the same time, there is, I’m certain, a genuine and heartfelt understanding among world leaders of what is at stake here. Most of them have met His Holiness – and while facing very serious Chinese pushback, recognize that the Dalai Lama’s position – genuine autonomy within the People’s Republic of China is attainable and win-win for all players involved. Thank you for your time Madam Chairman and Members of the Committee.